Sen. Tommy Tucker, R-Union, speaks at a Nov. 6 news conference. 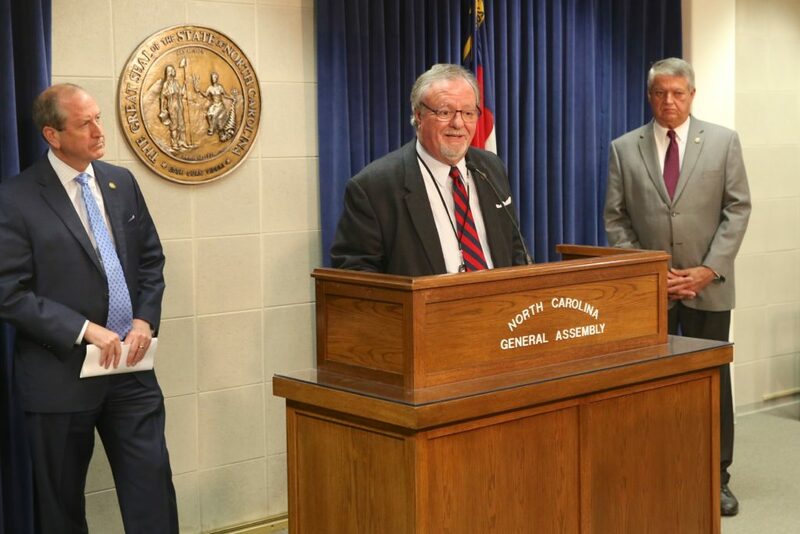 He was flanked by Sen. Dan Bishop, R-Mecklenburg, left, and Sen. Norm Sanderson, R-Pamlico. Election irregularities have been an open secret in Bladen County for most of this decade. A group of Republican senators frustrated with lax enforcement, including law enforcement investigations that seem to be going nowhere, say cleaning up the mess is essential to restore public confidence in election integrity. To root out election abuses and fraud, they’re calling on Gov. Roy Cooper to create a bipartisan task force. It would be directed to conduct a thorough, transparent, and expedient investigation into election irregularities in Bladen County. They also suggested possibly calling in the U.S. Attorney’s Office, the U.S. Department of Justice, launching a legislative investigation, and conducting a sweeping review of absentee mail-in ballot concerns on a statewide level. “There have been complaints, we now know, about absentee ballot by mail activity in Bladen in 2010, 2014, 2016, and … the terribly disheartening results” this year in the 9th Congressional District, Sen. Dan Bishop, R-Mecklenburg, said during a Thursday news conference. Republican congressional candidate Mark Harris’ 905-vote win over Democrat Dan McCready faces intense scrutiny over what appears to be widespread, coordinated abuses of absentee voting. “It is equally clear that over that period of time authorities have failed to get to the bottom of that problem,” Bishop said. “The problem is not being solved by prosecutorial authority so far, and certainly not by the state board of elections over three administrations” spanning Democratic Gov. Bev Perdue, Republican Pat McCrory, and Cooper. Bishop was joined by Sens. Tommy Tucker, R-Union; Paul Newton, R-Cabarrus; Norm Sanderson, R-Pamlico; and Senate Majority Leader Harry Brown, R-Onslow. Neither Cooper nor Senate Minority Leader Dan Blue, D-Wake, responded to requests for comment about creation of the bipartisan task force. Wake County District Attorney Lorrin Freeman has told news outlets she began investigating allegations of 2016 election fraud in January at the invitation of Bladen County District Attorney Jon David. She blamed the slow-moving probe on the cumbersome nature of sorting through paper ballots, and disruptions from Hurricane Florence. Freeman said the State Bureau of Investigation is digging into the possibility absentee ballot abuse altered election outcomes this year in the 9th District primary and general elections, and two local elections. Although the Bipartisan State Board of Elections and Ethics Enforcement is one of only two bodies with authority to call for a new election in the 9th Congressional District — the U.S. House of Representatives is the other — the GOP senators said it would be wise for another entity to handle the Bladen County investigation. “We don’t want to speculate on what the appropriate remedy is until the investigation is done,” Newton said of the possibility of seeking a new election. Bishop, Tucker, and Newton, who represent parts of the 9th District, called out potential transgressions by fellow Republicans. “When I see allegations of fraud against Republicans again it makes me sick,” Tucker said, calling election abuses a national embarrassment for the state. Bishop agreed. “Some people may need to go to jail,” he said, if they engaged in illegal election activity. The closely contested 9th District election has drawn national attention for months. Allegations that convicted felon and political operative Leslie McCrae Dowless was paid cash by Harris’ chief campaign strategist, Red Dome Group, for possibly illegal get-out-the-vote efforts have heightened interest and twice delayed the elections board’s certification of the election results. News reports show Dowless paid people to pick up absentee mail-in ballots and turn them over to him. That would violate state election law. Whether Dowless and his crew filled out voters’ ballots for Harris and discarded voters’ already completed ballots for McCready is part of the investigation. The state elections board will hold an evidentiary hearing by Dec. 21. It is unknown if the board will meet by Dec. 12, when a court order causes it to cease operation in its current format. House Bill 1117 has been introduced to reshape the board into two agencies dealing with elections and ethics enforcement separately. While the spotlight is on the Harris campaign, Republicans are raising concerns the Bladen County Improvement Association used similar tactics in past elections. The group is funded by the Democratic Party and Democratic elected officials. The senators gave examples of anomalies favoring former Democratic U.S. Sen. Kay Hagan in 2014 and Cooper in 2016. Tucker said General Assembly members found to have been involved with ballot harvesting should face state ethics investigations. Bishop and Tucker said their announcement was not intended to blunt rising criticism by opponents of the Republican-sponsored voter ID law that is now awaiting Cooper’s signature. Critics contend Republicans pushed voter ID to suppress minority and Democratic votes, while turning a blind eye to problems associated with absentee balloting some say favors Republican candidates.